ARCATA – The North Coast Resource Center (NCRC) is faltering, says its board president, and is having trouble meeting its basic obligations. Located at the Arcata Service Center, the NCRC is still managing to offer its twice-weekly Community Meal and maintain food box deliveries to the homebound, plus basic services such as laundry and showers. But lacking eight boardmembers, with multiple staff slots vacant and inadequate funding, Board President Derk Schulze said the organization’s future is uncertain. One immediate casualty may be the seasonal Extreme Weather Shelters (EWS) managed by the NCRC in cooperation with area churches. The EWS operated on nights when the temperature fell below freezing or when other severe weather hit. 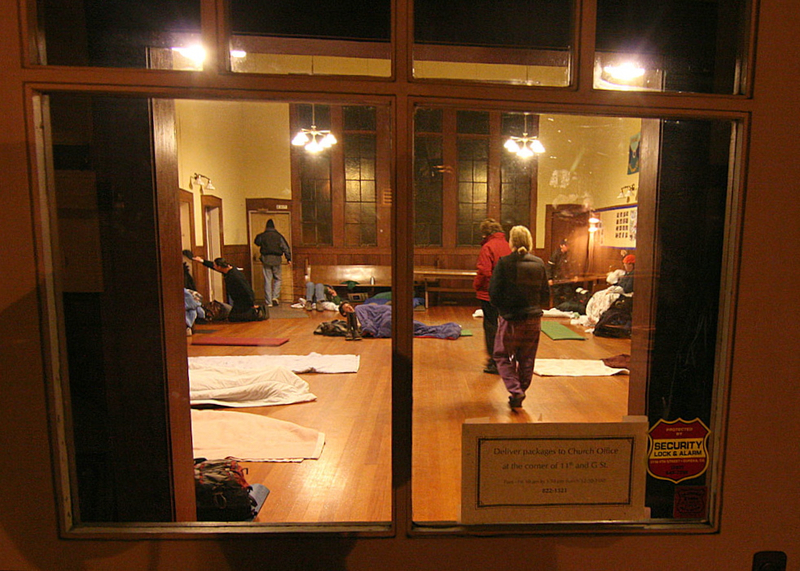 Homeless individuals would apply at the NCRC, be screened, bathed, fed and transported to area churches to spend the night, then returned to the NCRC in the morning. Last December, Schulze, pastor of Sunny Brae Church, along with Rev. Tim Doty of Arcata Presbyterian Church, Rev. Sara Potter of St. Albans Episcopal Church and Rev. 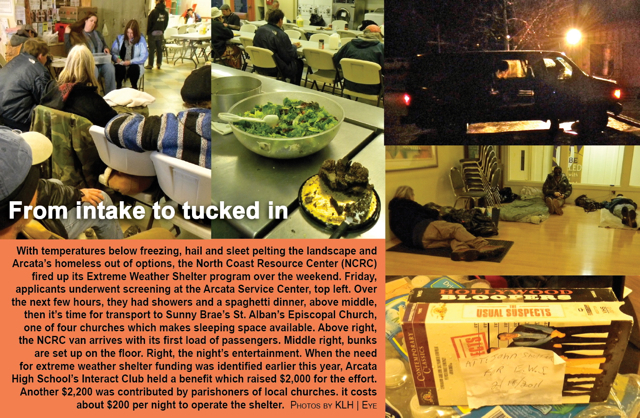 Cindy Storrs of Arcata United Methodist Church put out a combined call to the community for funding to cover costs of last winter’s extreme weather shelter. The shelters were estimated to cost $200 per night for food, fuel and other logistical support. One of last winter's Extreme Weather Shelters. Response was overwhelming, with donations rolling in from individuals and the participating churches. The Rotary Club of Arcata Sunrise kicked in $1,500, and a benefit event at the Bayside Grange organized by Arcata High School student Sarah Han raised another $2,000. All in all, said NCRC Director John Shelter, about $6,800 was raised, and 17 extreme weather shelters were held. Now, with bad winter weather looming, there is no money left to operate this season’s EWS, and some of the pastors are wondering what happened to what should have been a surplus of funds. Doty said he has asked Schulze for an accounting of the funds. Schulze declined to offer specifics, but said that the NCRC is operating on a “tattered shoestring budget” this year and is struggling just to keep the doors open. Regardless of the financial machinations, the bottom line is that homeless people in Arcata will have nowhere to go when storms hit. This concerns Mayor Susan Ornelas, who has suggestions. The pastors have said that they are not qualified to conduct the intake, screening and prepare eligible applicants for the shelter, and that the NCRC is the only entity with the facilities and experience to handle those tasks. The NCRC needs volunteers and donations of food and cash. Contact the NCRC at (707) 822-5008. This entry was posted on Wednesday, November 16th, 2011 at 9:11 am	and is filed under News, Community. You can follow any responses to this entry through the RSS 2.0 feed.